I decided to do a round taking in two Wainwrights that I had missed out on my other walks in the area. I started with Seat Sandal and chose the route up the the steep breast. The path follows the green trail through the dying bracken. It was a lovely morning and the views opened up as I climbed higher, here the Langdales appear over the top of the Helm crag ridge. And the Coniston fells appear from behind Silver how. Higher up now but still a bit of climbing to go. On to the top at last and the views open out towards the north and east. 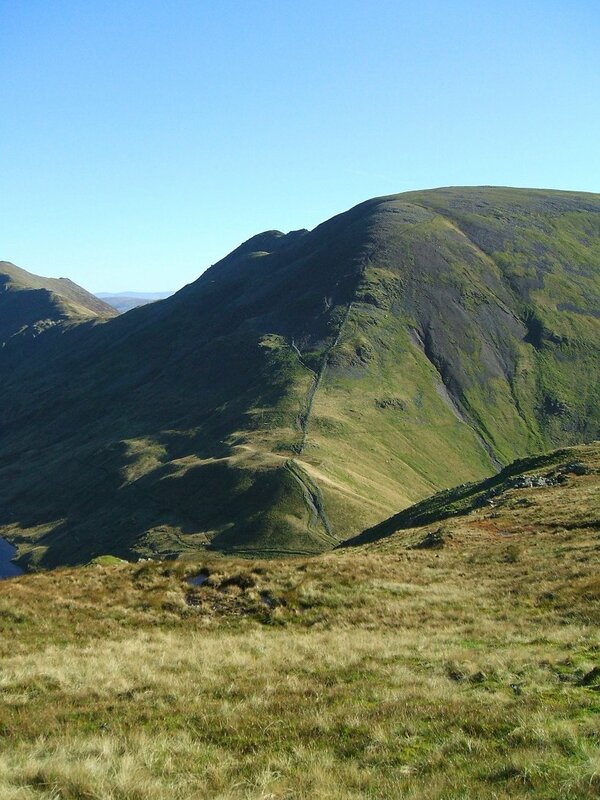 Fairfield is on the right with St Sunday crag and Cofa pike still in shadow. Looking to the Scafell group from the summit. Fairfield. I did consider contouring round to Stone Arthur on the thin path you can see going to the right but when I got to there it just seemed to lead to some crags, so plodded on up the steep path to the summit. A smashing view from the drop down to the col between Seat Sandal and Fairfield. Striding Edge from the path up to Fairfield. Windermere leading to the sea from Fairfield. The far eastern fells march into the distance from the same place. Coming back down now and Easedale tarn and Sourmilk gill are well seen. Looking up to Stone Arthur from the minor road just off the A591. Helm crag from the road.